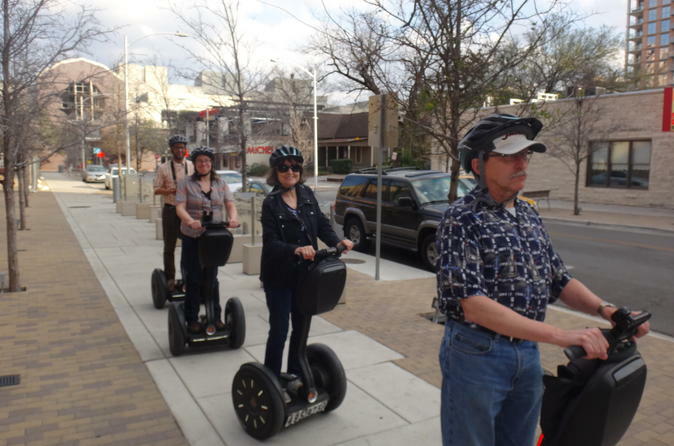 Come ride a Segway around Austin; it's the best way to see the sites. These group tours start at 3:30pm with an orientation and are followed up with one-on-one hands on Segway rider training, you don't have to know how to operate them. This tour is a 60 minute glide around downtown after up to 30 minutes of practice. Austin is wonderful city, come take a Segway to see what the town is all about. Welcome to Austin! The “Ride The Segway” tour is a fun way to experience the Segway while getting an overview of the town. The tour begins at 3:30pm and lasts 60 minutes after training where you will glide alongside Austin's popular landmarks, The State Capital of Texas, The Driskill Hotel, The Paramount Theater, The Governor’s Mansion, and more. After cruising around town on your Segway, the tour will stop at the Driskill Hotel for a quick break and a chance to see inside the first hotel that opened in 1886 on Christmas Day. We have been rated #3 activity to do when visiting Austin; our tour is affordable and educational. This is a fun way to see downtown Austin.